he British Boxer Club is the oldest Boxer club in the UK, founded in 1936 when it gained Kennel Club affiliation. Since then the Club has seen many changes and we hope that our website will supply you with any information you might need, whether you are a Boxer owner, breeder, or enthusiast. As a breed club, we put on a Championship Show each year, usually at the beginning of August, and our current venue for this is the purpose-built Kennel Club Centre at Stoneleigh Park in Warwickshire. At this event our prestigious ‘Champion of Champions’, ‘Sire of Merit’ and ‘Dam of Merit’ Trophies are awarded annually. We also hold two Open Shows, held in April and November, in Oxfordshire. left to right:- Marion Seeney (Hon Secretary), Laura Clark, Phyllis Borrelli. To serve the ‘Working Boxer’ community, we run a ‘Working Day’ in September. Do not be put off by the name of this event! It is huge fun, with a spectrum of activities just for Boxers, including obedience, agility, Boxer racing, temperament testing, and tasters of gundog work, working trials and flyball. Alongside these activities there is a companion dog show with all the traditional classes, open to all breeds. As a Club, we aim to encourage and support our members’ interests, and also the interests of the breed as a whole. To this end, we invite our members to let us know what issues concern them within the breed and what initiatives they would like us to pursue in relation to the Boxer breed. On the Breed Council platform, three members of the British Boxer Club committee currently serve on the Health Sub-Committee. One of our committee also works as a representative on the Kennel Club accredited breeder scheme. An introduction to the Club would not be complete without adding that the motivating factor for each of us is the love of the Boxer, a breed of dog with a huge personality and a great sense of humour, who gives unstinting love and devotion to his owner his whole life long. We recognise that in principle we own our Boxers, but in truth we are owned by them! British Boxer Club Members benefit from reduced entry fees at our three shows held throughout the year. We no longer produce a newsletter, but show results can be found on this website and any important news is either here or on our Facebook page. Club members also have the honour of voting for the winners in the prestigious Boscar awards presented by us at the Annual Boxer Event. 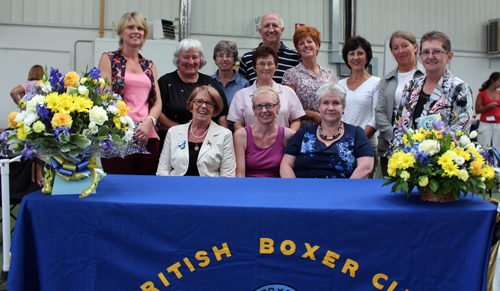 If you would like to become a Member of The British Boxer Club, Please click the relevant links below Please also take the time to read our Code Of Ethics.